This article explain how to connect your Mac syslog to Apsolab-Server. To forward your Mac logs to Apsolab-Server you need to enable Apsolab-Server syslog parser. With administrator account (root), open Settings from Administration menu. Select Services tab. In [Syslog] section, enter UDP port number. 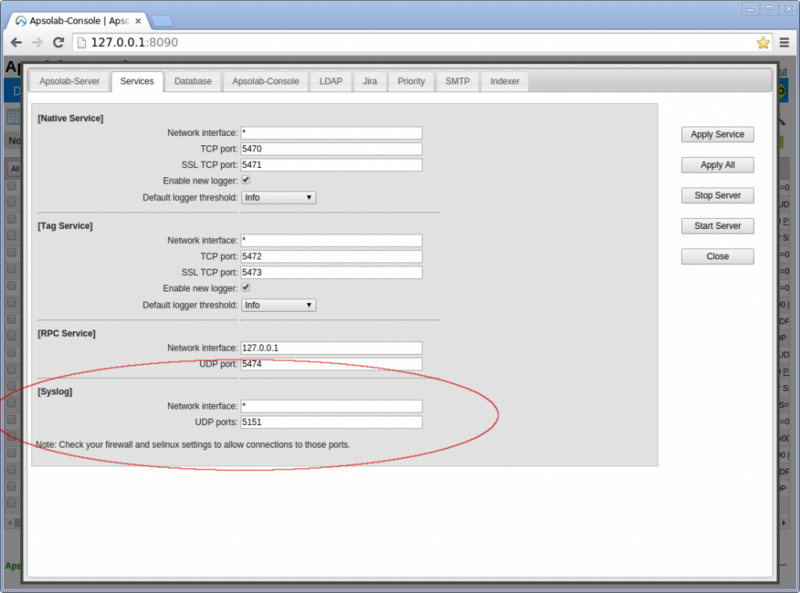 You can use multiple UDP ports if you want more control over logging threshold, filtering and monitoring. List all ports separated with comma. Click ‘Apply Service’ to save your changes. Click ‘Close’ to close this window. Don’t forget to enable those ports in local Apsolab server firewall. Mac OS X run syslogd and it is configurable from /etc/syslog.conf file. To forward logs to Apsolab-Server, you will need to edit this file with the root account. For that, open a terminal and login as root. You can copy/paste the following lines into /etc/syslog.conf file and make the appropriate changes. In this example, we forward logs to our Apsolab server (host: apsolab) on UDP port 5151. Our server host name is apsolab. You can use a host name or an IP address. # Forward logs to apsolab host on UDP port 5151. Make sure your firewall allows connection to external UDP port 5151. To make your change effective, restart syslogd service or reboot your Mac.